Given that the United Patent Court will appoint 40 judges to rule on Europe-wide injunctions, it is vital for industry and the legal profession that the candidates have extensive experience. For the first time, experts from in-house and private practice have nominated their favourite candidates. But none of the obvious candidates are heading the field. For once, consensus in Europe: “The UPC’s first few judgements need to be really good, then really good and then after that really good,” says one German patent judge, mirroring the prevailing view among patent experts across Europe. If not, industry could rapidly lose confidence in the new system and the Unified Patent Court could fail. They also agree that selection of the UPC judges should be on merit rather than the proportional representation so typical of EU institutions. That means, posts being filled by experienced patent judges only. Otherwise, experts argue, industry is unlikely to see the worth in using the new system and will stick to national courts instead. Appointing the right judges could very well mean the difference between success and failure of the UPC. It will certainly not be down to a shortage of candidates. Over the past year, around 250 legal judges and 600 technical judges and patent attorneys have expressed an interest in becoming a judge at the UPC. The process of screening judges will enter its critical phase as soon as the so-called Provisional Application Phase (PAP) finally gets off the ground, so a final date is not yet clear. Planners have budgeted 16 full-time positions for when the UPC opens its doors in December, although most judges will initially be part-time with only a handful working full-time (mainly in the Central Division and Court of Appeal). Some 35-45 legal judges are to be appointed first, followed by an as-yet-unknown number of technical judges. But the decision to launch the court with so many part-time judges has come under fire from practitioners who fear this will negatively impact quality. Feedback from the industry and patent law specialists shows that staffing the panels for the UPC’s Court of Appeal and Central and Local Divisions is vital. In a non-representative survey conducted by JUVE Patent, the preferred candidates turned out to be highly seasoned European patent judges. German and British judges with many years of experience in national patent courts came out on top, dominating the top ten in the first European patent judge ranking . The number one spot was taken by Thomas Kühnen, Presiding Judge of the 2nd Civil Senate at the Higher Regional Court Düsseldorf. He is the best-known and most influential patent judge in Germany, but also the most controversial. Kühnen is renowned for his court style, and for not mincing his words. Even those in London, Amsterdam and Paris have heard of “Judge Kühnen”. However, unlike the Federal Court of Justice judge Klaus Grabinski, who came a close second, Kühnen is not a fervent supporter of the UPC. Although he has applied for a post – like the rest of his peers on the Düsseldorf patents scene – he has always emphasised that the conditions need to be right. 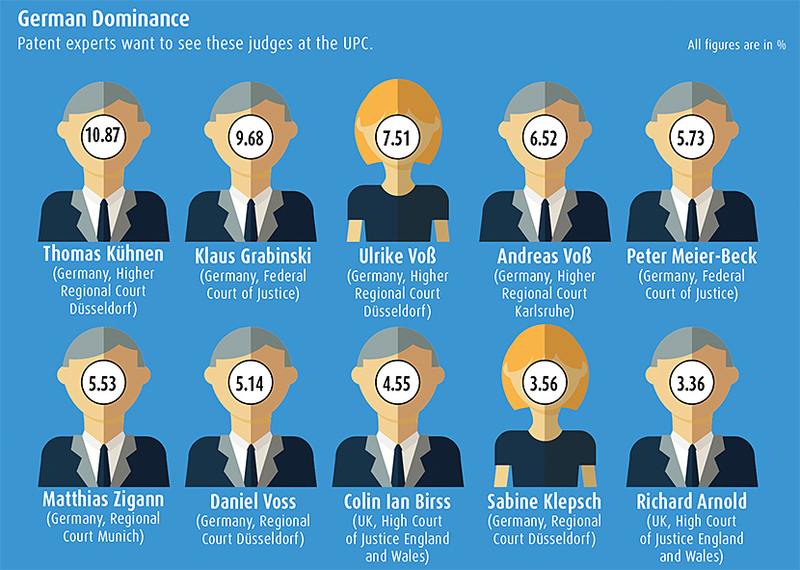 Salaries for the UPC judges have been determined (and are mostly described as handsome) but the details concerning how the judges will be deployed – at least in Germany – have not. Furthermore, Kühnen himself has stressed that his foreign-language skills may not be up to the task of presiding over proceedings in English. Nobody doubts, however, that his professional expertise will make the grade. The candidates further down the ranking are no lightweights either. 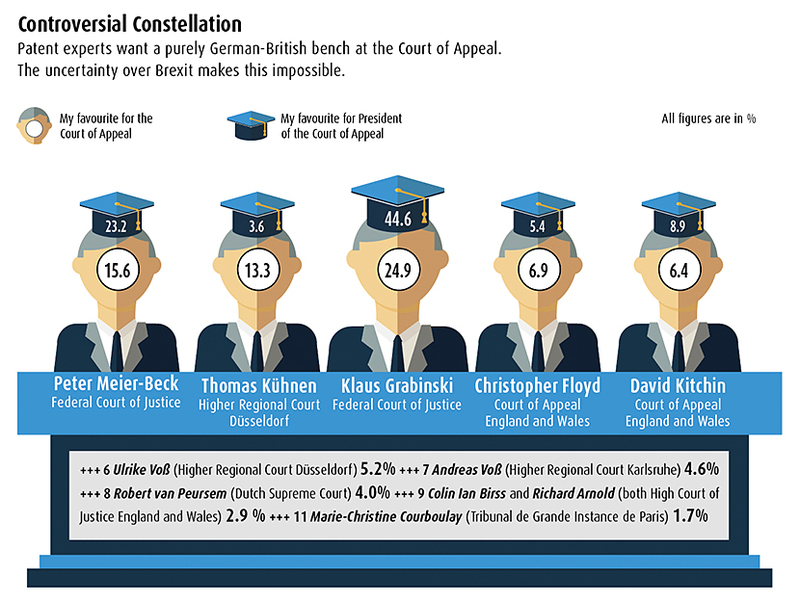 Of all the German judges on the list, Klaus Grabinski probably boasts the highest international profile. Given that he was one of a team of experts who prepared the Rules of Procedure for the UPC, he could have been a shoo-in for first place. In third place, however, was an even greater surprise: Ulrike Voss, Presiding Judge of the 2nd Senate at the Higher Regional Court Düsseldorf, is also regarded as well versed and accomplished. Indeed, it was her senate that referred the patent dispute between Huawei and ZTE to the European Court of Justice in a bid to gain Europe-wide clarity concerning injunctions sought by standard-essential patent holders. It is considered one of the most significant rulings of the last decade and continues to occupy various courts today. “A very objective and courageous judge, who isn’t afraid to deliver judgements that go against prevailing legal doctrine, if that’s what the case calls for,” said one respondent. Considered to be more reticent than some of her colleagues, Voss has never made any song and dance of her UPC ambitions and tends to operate more in the background. For this reason, she may have been somewhat overlooked as a potential UPC judge before now. That German judges hold sway over the JUVE Patent ranking comes as no surprise. Experts predict that around 60% of European cases will go before the German courts. The country not only boasts the highest number of experienced judges, but also plays host to nine specialist chambers and five senates at the Regional and Higher Regional Courts in Düsseldorf, Hamburg, Munich and Mannheim/Karlsruhe, not to mention the judges at the Federal Patent Court and the Federal Court of Justice. About 50 judges with extensive patents expertise will come from Germany alone, combined with around ten seasoned patent judges from the UK and The Hague. Countries such as Belgium, France, Italy and Scandinavia are likely to contribute around a dozen judges combined. Of course, the dominance of German judges in the ranking is partly attributable to the disproportionate number of respondents from that country. But it is interesting to note that, although lawyers and in-house counsel show a clear preference for judges from their own country, they also show a willingness to embrace candidates from other UPC states – provided they have the necessary experience. Colin Birss, widely regarded as the most renowned judge in London, and High Court judge Richard Arnold were ranked eighth and tenth place respectively. Both are preeminent figures in patent law at the High Court of England and Wales and have played a vital international role in the creation of the UPC. The fact that more British judges did not make it into the top ten is possibly due to the political uncertainty in the UK at present. The UK has announced its clear intention to ratify the UPC agreement and help launch the court. Less clear, however, is whether it will still be able to participate in the system once the country has left the EU. In the event that Brexit also means exiting the UPC, then not only will the British judges have to stand down, but the Local Division and London arm of the Central Division will be disbanded – a nightmare prospect. Not least because, according to JUVE research, the British government is currently investing around €160,000 per month in setting up the UPC infrastructure at London’s Aldgate Tower. Patent experts who took part in the JUVE Patent survey thus appeared somewhat reluctant to choose too many British judges as their desired candidates. Nevertheless, there was a clear correlation between having Brits on the judge’s bench and high expectations of quality UPC rulings. This is likely because the new court and its Rules of Procedure incorporate considerable elements of common law. “It would be entirely counterproductive to fill them with only continental European judges,” said one patent expert. Along with their German and Dutch counterparts, leading patent judges in London comprise the first part of the JUVE Patent ranking. At number 26, French judge Marie-Christine Courboulay, who presides in the High Court of Paris, is the first judge in the ranking to hail from a country other than the UK, Germany and the Netherlands. As one of Europe’s three major patent applicants besides Germany and the UK, France will take up pole position in the UPCt i. The City of Lights is to be the seat of the UPC’s Central Division, as well as court administration. Furthermore, France will determine the first president of the Court of First Instance. This is said to have been negotiated by the heads of government at the European Council and subsequently enshrined in the UPC agreement. 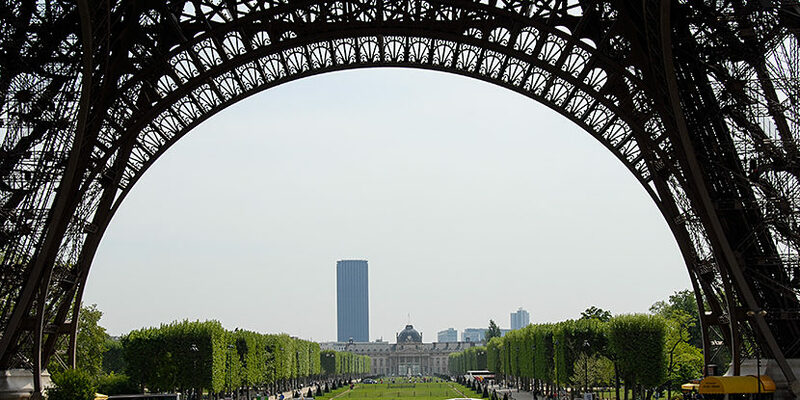 “At least, that’s how the French see it,” said a high-ranking member of the Preparatory Committee. In fact, Article 14 stipulates that the president must be elected by all full-time judges of the Central Division from among their own ranks. The first president “shall” be a national of the country hosting the seat of the court. Experts claim the way the article is formulated leaves considerable margin for discretion on the part of the judges. Experts also claim this issue is controversial because France has a dearth of suitable candidates. Either experienced patent judges such as Courboulay lack the necessary proficiency in English, or conversely, those judges skilled in English and administrative issues lack the required expertise in patents law. The President of the Court of First Instance will have a pivotal function. Not only will he or she direct judicial activities and administration, but more importantly, the president will select and allocate the third legal judge to the Local Divisions on a case by case basis, meaning he or she will have considerable influence over the quality of the actual rulings. The same goes for the technical judges when questions arise pertaining to the ongoing validity of the disputed patent. Of even greater significance for the UPC’s launch phase, however, is the president of the Court of Appeal. It is clear from looking at the JUVE Patent ranking that patent experts would like to see German judge Klaus Grabinski take over the reins. Respondents are convinced that, with him, the Court of Appeal in Luxembourg cannot fail to ensure the harmonisation of case law between the many divisions dotted throughout Europe, or to review injunctions made by Local and Regional Divisions. But during the preparation phase of the UPC, whisperings of a so-called “vampire division” have been making the rounds. Some fear that a division will be established in Sofia, Budapest or Bucharest which will give rise to forum shopping and lure NPEs away, resulting in inexperienced judges issuing Europe-wide sales bans. UPC advocates insist there is nothing to worry about, as there will be a standing judge on hand at the Court of Appeal with the power to suspend these kinds of rulings. Nonetheless, the industry is alarmed. Klaus Grabinski has long been touted as a candidate for the Court of Appeal and potential president. Now the JUVE Patent ranking confirms him as the most popular choice among European patent experts, who put him far above his Senate of the Federal Court of Justice colleague, Peter Meier-Beck, and British judge David Kitchin. 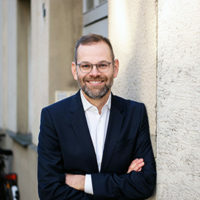 Many lawyers and general counsel would be happy to see a triumvirate of Grabinski, Christopher Floyd and Thomas Kühnen at the highest echelons of the UPC. But realistically, a purely Teutonic-British setup is untenable given that the UK’s future participation is so tenuous. Far more likely is that all five judges at the Court of Appeal will be selected from different member states. In any case, veteran judges such as Kühnen, Grabinski, Meier-Beck, Birss and Arnold, as well as the highly respected Dutch judges such as Rian Kalden and Robert van Peursem, will all undoubtedly benefit the court – especially in its early days. But it is the younger judges that will be shaping case law in the long term. The onus is on today’s budding, internationally trained judges waiting in the wings of the patent courts in Amsterdam, Düsseldorf, London, Mannheim and Munich and many of them are ready to take up an important role. As a reflection of this, many younger names also emerged in the JUVE Patent ranking. The fact that the Presiding Judge of the 3c Civil Senate at the Regional Court Düsseldorf, Sabine Klepsch, and her counterpart at the Regional Court Munich, Matthias Zigann, made it into the top ten is not only a positive sign but also a call to arms. For many – above all the younger judges – the UPC is a once-in-a-lifetime career opportunity: the chance to help build a court from the ground up, to write law from scratch. The good pay is just the icing on the cake. Last year the Preparatory Committee fixed gross monthly salaries at €11,000-€12,000, making the UPC considerably more lucrative for German patent judges than the national courts. The salary will be particularly attractive for judges at those patent courts set to become Local Divisions. A presiding judge at the Regional Court Munich earns a yearly salary of around €87,800, with a presiding judge at the Higher Regional Court Munich earning €93,000 per year. Slightly worse off are the presiding judges at the patent divisions at the Regional Court Düsseldorf with an annual salary of up to €77,640, rising to €85,680 for those at the Higher Regional Court Düsseldorf. Patent judges at the national level enjoy a somewhat larger pay packet: a presiding judge at the Federal Patent Court can expect to take home around €92,500 per year, rising to €115,600 at the Federal Court of Justice. Another factor lighting a fire under many patent judges is the fear that, should the UPC prove a success, national patent courts will inevitably decline in importance. No patent judge wants to become irrelevant. In talking to and about Thomas Kühnen, one gets the sense that he wants to be part of the UPC and yet he does not. On the one hand, Düsseldorf’s top dog is feeling the itch and yet on the other, he is hesitant. Until the rest of the conditions are hammered out, Kühnen – like the rest of his peers – is likely to remain on the fence. But ultimately the time is coming for him to make a decision: the 40 UPC judges will be appointed once the Provisional Application Phase has got underway. Then, the time for sitting on the fence will be over. In February 2017 JUVE Patent asked the heads of patent departments in selected technology companies across Europe, as well as lawyers and patent attorneys at major law firms with patents expertise, the following question: of all the European patent judges who are your favourite candidates for the United Patent Court? The survey focused on Germany, the UK, France and the Netherlands. 225 experts answered, predominantly lawyers and patent attorneys. Answers heavily favoured the legal judges. The survey asked respondents generally for their favourite candidates for the new court – and especially the Court of Appeal.